Unique Oceanfront Luxury Estate on 3 Acres for rent by owner only. The most unique rental opportunity in the entire Outer Banks offering prestigious landmark sites like no others, this gracious, spacious home sits high on a bluff-like dune. On it's 23 foot elevation overlooking the majestic Atlantic Ocean, Currituck Sound, the famous Monkey Island and Penny's Hill Dune, SUNNYBANK boasts of the best views for 100 miles. Experience seclusion with easy accessibility. Located only 5 miles from Corolla's Food Lion and 2.4 short miles off the paved road. (If you don't have a four-wheeler reasonable rentals are available at your local airport.) Savor the water views from every room. Let unsurpassable ocean sunrises and sound sunsets mesmerize you. Explore the magic timelessness of the Outer Banks 50 years ago, before roads and traffic. View the spectacular star filled skies through a new binocular telescope without annoying streetlights. Photograph dolphins offshore or a herd of wild ho! rses, birds and various wildlife sipping water from one of the local fresh water pools. 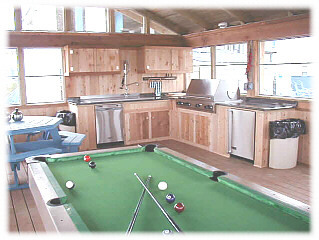 Large kitchen bar along with the dining and breakfast rooms provides seating for over twenty. A four-person elevator allows easy access for you and groceries to your gourmet kitchen. Surf, swim and fish from your own beach. Kayaks are included so you can paddle out to explore the Monkey Island Ghost Town, do some crabbing or have an ocean adventure. Beds: 1 king, 1 queen, 4 twins, 2 bunks, 2 twin sleeper chairs, double pull out sofa. 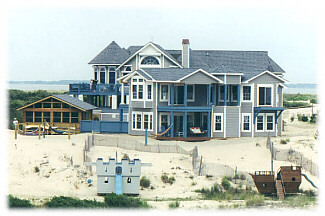 Oceanfront on Outer Banks, North Carolina. 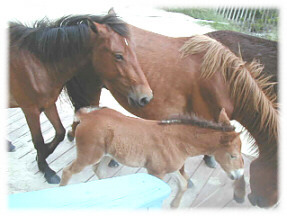 The home of the only true Spanish Mustang herd in the world still living in the wild. Other Information about the sleeping facilities: 5 Bedrooms/4 full baths & 2 half baths also an enclosed outside shower with bathroom. 1 King sunken master suite includes a separate nursery with crib, toddler bed, cradle, changing table, and portable playpen, 1 ocean facing balcony and 1 sound facing balcony, a sitting room/small library, bathroom with Jacuzzi and large walk in shower. Queen sunken master suite with Satellite TV & VCR, walk in closet, bathroom with Jacuzzi and walk in shower, covered decks with hot tub and steps to pool. 2 sets bunks and full bath. Two twins & full bath, covered deck with hanging swings and sitting room with 2 chairs convertible to twin size beds and Satellite TV. Twin day bed with pull-out twin, half bath, VCR only, covered deck with love seat and steps to pool and outside facilities. There is also an outside enclosed bathroom and shower. Other amenities not listed above: Amenities: 16x43 ft. long pool 8 ft. deep with 8 built-in sitting benches, Hot Tub Elevator, Beds Made, 2 Jacuzzis, Wine Refrigerator, Refrigerator with Ice Maker, Jenn-Aire Island Range, Full Size Refrigerator and Full Size Freezer, Breadmaker, Expresso/Cappachino Machine, Food Processor, Cigar Humidor, Tap System, High Chair, W/D, 4 TVs/VCRs, Microscope, Binocular Telescope, Vermont Wood burning Fireplace, Stereo, Games & Videos, Ceiling Fans, Screened-in Room with retractable screens, Covered and Sun Decks, Kayaks, Bogie Boards, Skim Boards, Ping Pong, Volley Ball, Grill, Enclosed Outside Shower with Bathroom, Fish Cleaning Station, Beach Tent, tons of Deck Furniture & Hanging Swings, large outdoor play boat, exercise equipment & Little Tykes Full Kitchen. Book and Video Library Grocery delivery option. Pets possibly allowed. Well behaved Salty Dogs possibly permitted for an additional charge. GOOD NEWS!! Currituck county has no lease laws. Other activities/entertainment: Near by activities: Golf, Miniature Golf, Tennis, Bicycle Rentals and Wall Climbing. Sailing and Windriders, Windsurfing, Hang Gliding, and Tandem Hang Gliding over Water. Go-Karting, Paddleboats, Parasailing, Kite Surfing, Aqua Cycles, Jet and Pontoon Boats. Four Wheeling, ATV Rentals, Horseback Ridding on the Beach, Deep-Sea and Fly-Fishing. Scuba Diving & Snorkeling, Duck Hunting, Alligator River Tours, and Evening Bear Watch. 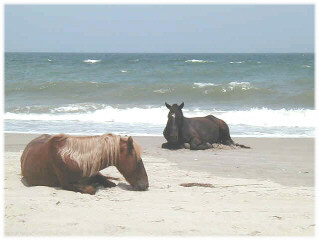 Wild Horse Safaris and Wildlife Encounter Tours. Shopping, Movies and Fine Dining. SPECIAL TRAFFIC TIME SAVER begins January 2001. FRIDAY to FRIDAY rentals. **No more long weekend traffic delays or supermarket lines! 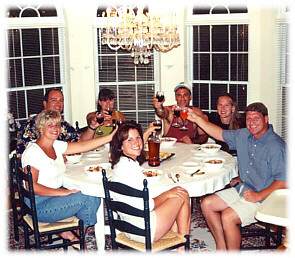 ** Beginning "2001" a special clambake, BBQ or dinner will be catered for you at SUNNYBANK to thank you for being our guests. 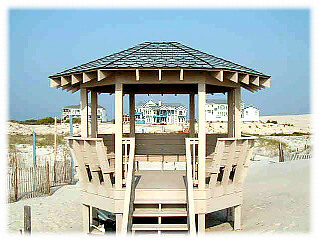 groups of 3 to 4 people or monthly rentals. Call for holiday rates and specials. Call for special last minute openings.